Gold has had a nice run off the Chinese yuan devaluation news with short covering the dominant reason behind the buying. For without that, the rally has no staying power but will fizzle out once the weaker-handed shorts are run out. Typically, when looking over a market that is experiencing a bout of short covering, one can see it show up in the VOLUME. Volume speaks to emotion and nothing moves markets like FEAR ( if there is any doubt about that, you should look at the volume of trade done in the corn and the beans today as the USDA report touched off a PANIC among longs). 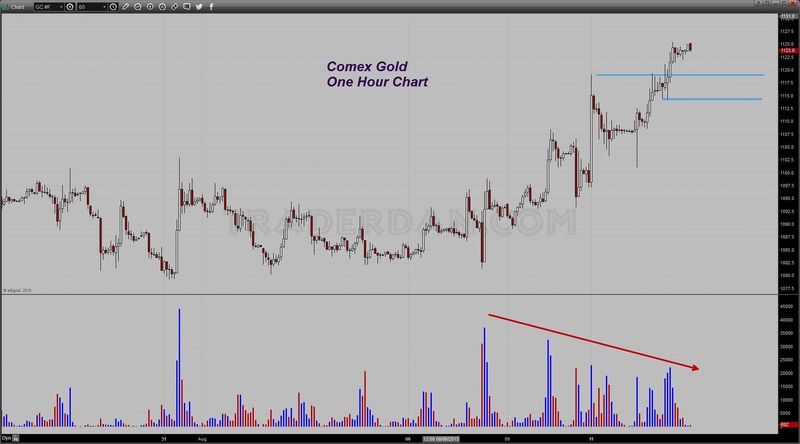 In looking over the hourly chart, we can see that the volume is beginning to fade as the price moves higher. This does not mean the potential to move further is done; but what it does mean is the some of the urgency among the shorts is fading. Price movement higher hit a temporary stall near $1125. It will now take a strong push through these highs to spark some further short covering. If that were to occur, I am going to be extremely interested in seeing the volume that might accompany such an occurrence. The problem for gold remains the same as before – will it thrive off of currency debasement issues as it is currently doing or will it go back to suffering from deflationary pressures? I do not know the answer to that. The market does however so our best bet is to keep a close eye on these price charts and let them inform us. We can also keep an eye on the GLD reported holdings to see if they are getting a SUBSTANTIAL increase. So far the increase we have seen over the last couple of days was a mere 4 tons. While that is positive it is a long way from being anything substantial especially when one considers that reported holdings remain DOWN from the start of the year 37 tons! It was just last week that holdings had fallen to 667 tons, a near SEVEN YEAR LOW. Aiding the bullish cause is the recent performance of the mining shares. 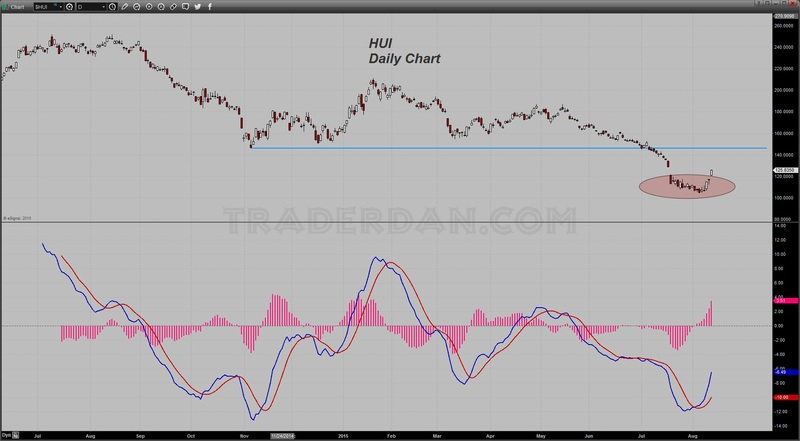 The HUI has created an ISLAND BOTTOM on its daily chart. Bulls will NOT WANT to see that gap that was formed today closed. There is yet an overhead gap that needs to be filled. The bottom of that gap lies about 3 points above today’s high. In looking at the ADX/DMI, the ADX turn lower confirms that interruption of the strong downtrend that has held gold for a while now. Also, the upside crossover of the +DMI ( BLUE) above the -DMI ( RED) is the first buy signal since May. That particular signal did not last long. 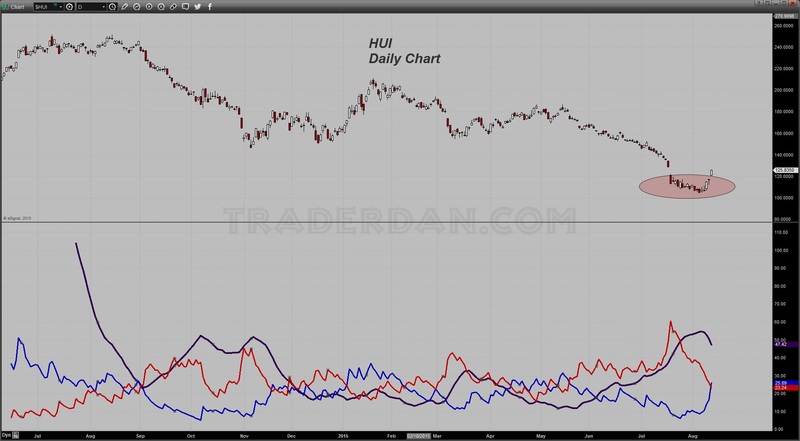 The MACD is also now in a buy mode. 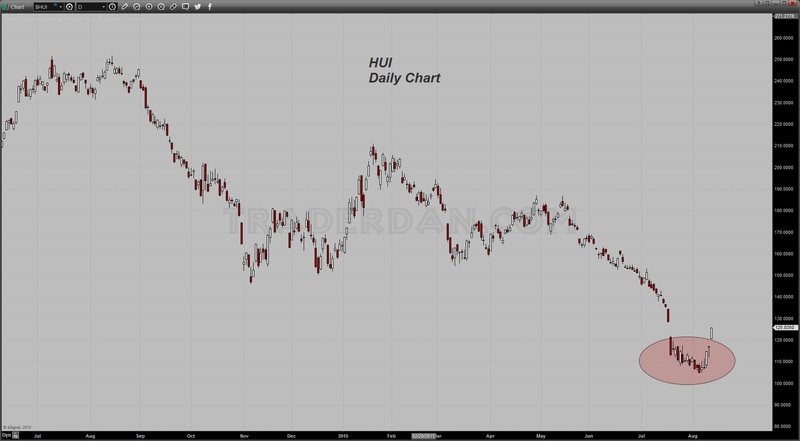 The HUI has been beaten so badly that it can actually run a long way just to reach the BROKEN SUPPORT LEVEL that collapsed in early July. In my view, this is a short term phenomenon rather than the beginning of a major bull run in gold. How far these rallies can go is unclear and no wise trader should make predictions especially in this novel environment in which we see currency devaluations become more and more commonplace. We are still dealing with a deflationary environment, one that has not favored gold nor any other commodity for that matter. Whether or not a currency devaluation in China can turn that around remains to be seen. So far, a weakening of the Yen, and the Euro, and the British Pound, and the Canadian Dollar, etc. has not done the job. That is why I do not expect a Chinese Yuan to do anything either. We are dealing with the excess of credit, cheap money, overbuilding, etc,. in China. How a weaker currency can permanently deal with that escapes me. The problem as I see it – and the best way I know how to describe it is to use an analogy – is that everyone wants to party hearty and have a great time but then want to avoid the hangover the next morning. We all know from experience, if you do not want the hangover, practice some discipline and self-control the evening before. That course of action is unknown to our modern generation of leaders – in ALL COUNTRIES. Every political leader wants the benefits of a growing economy and good times under their watch. That is where their political fortunes are made or lost. The Chinese authorities are no strangers to this view either. No one wants the aftereffects of a credit binge taking place during their tenure and thus, they will pull out all the stops to avoid dealing with “the hangover”. The problem is, none of these stop gap methods do a single thing to address the ROOT CAUSE of the economic slump. All they do is to delay the day of reckoning. Sometimes to actually cure a disease, a foul tasting medicine needs to be administered if you really want to kill that invading bacteria or virus.